We hope to see everyone at the 2015 Field Day of the Past this weekend! Both the show organizers and property owner are very excited to have our club at the show and have reserved the premier show location for the club! We will be featured at the most popular area of the show and they reserved this spot for us to show together. Please be sure to let them know that you are with the club when you arrive so they can direct you to our show spot. Please be sure to thank the tractor show organizer, who goes by the name of Pope, for making this possible. 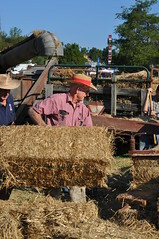 He is a member of the Chesterfield antique tractor club and is interested in joining and participating in ours. The owner of the property for this event, Mr. Pruett is so excited we are coming that it is rumored he will invite us to take a private tour of his extensive and rare collection of IHs. I hear he has some very rare IH orchard tractors as well as some implements and IH trucks. In addition, Mr. Pruett decided to include many of his IHs in the show. He will be setup right beside us so there should be plenty of IHs to enjoy! The meeting was called to order by Tinker Moats. The Board had decided it was not necessary to read the minutes at each meeting. Cynthia provided handouts for members to read. The main points for the June Meeting were read. A motion was made to accept the minutes. It was seconded and approved. The club will be represented at Sommerset, Sept. 11-13, 2015 and Rockville, Sept. 18-20, 2015. There was a good turnout at Berryville. The club received applications for new members. For the Rockville Show if you bring a tractor you will receive two or three passes for the Show. The Fairgrounds is booked through 2020 for our Show. The Show in 2016 will be July 8-10, 2016 and the Shows after that will be the fourth weekend in June. Tyrone said that October 10, 2015 will be good for our fundraiser. We will do BBQ sandwiches again. The sandwiches will be $3.00. The sandwiches will be presold. Jennifer will let everyone know the date she needs the total number of the sandwiches. Tyrone will need help to cook the meat on October 9th. The club will meet at Cross Keys Worship Center October 10th at 8:30 A.M. to make the sandwiches. The National Auction is October 30-31, 2015. The Maryland Club is having the Auction. Our Club will take a table and help with the Auction. Raymond Grogg asked if our club would be interested in participating in The Creative Work Farm. 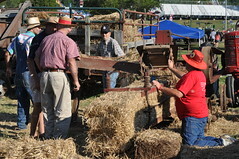 The event is for children to learn about farming and farm equipment. The event is on October 11, 2015 from 12:00 to 5:00. The Farm is on Purple Cow Road. 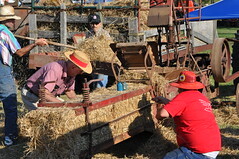 Members could bring tractors that the children could climb on and sit on. A motion was made to have our October Meeting at this event. It was seconded and approved. Tinker said he knew a caterer that would possibly be available for our Show. Tinker was asked to follow up on this. Tinker said he had an individual that would set up activities for kids in a designated area for our Show. There would be a designated entrance and exit. A motion was made to follow through with this idea. It was seconded and approved. Having more help with our auction was discussed. There will be more discussion at a later date. As there was no other business, a motion was made to adjourn. It was seconded and approved.